Knowing and following your peak time savings. Here is the little known secret to finding out and following your electric companies energy schedule. 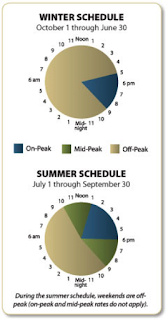 Saving money on your electric bill is as simple as following the Winter/Summer energy schedule from your power company. Electric bills are based on how many kWh (kilowatts) are used. Off-peak and Mid-peak Kwh costs less than On-Peak times… so plan your energy use to fit the schedule to start saving today! · Wash and dry your clothes, run the dishwasher, chargers and other appliances after 9:00 p.m. or before 10:00 a.m. based on the sample schedule below. Weekends are a great time to complete all laundry and save money, as they are “off-peak”! · In the warm months, set your thermostat to 78 degrees during peak hours. Install a smart thermostat that can automatically adjust the temperature while you are home and/or away. Purchasing a smart thermostat will cost a little up front, but the monthly savings will surpass your initial cost, making it a smart choice. The Nest learning thermostat is a great choice because it has an auto scheduler, it actually learns the temperature you like and sets it to that temp. You can also use the auto away feature to reduce cost while not in the house. The Nest can also be controlled by your phone, tablet or laptop. If you purchase the Nest Learning Thermostat ComEd will give you a $100 Rebate, making this an affordable price to help you save in the long run. You could also close all blinds or drapes to keep out the heat. Ceiling fans will make you feel cooler in a warm room but should be turned off when the room is unoccupied to save energy. · In the colder months, set your thermostat to 68 degrees and to 55-68 degrees when no one is home. Open window coverings on the sunny side of the house for free heat from the sun. · If you don’t need the lights on, turn them off. · Keep your refrigerator coils clean by vacuuming and keep your freezer full. 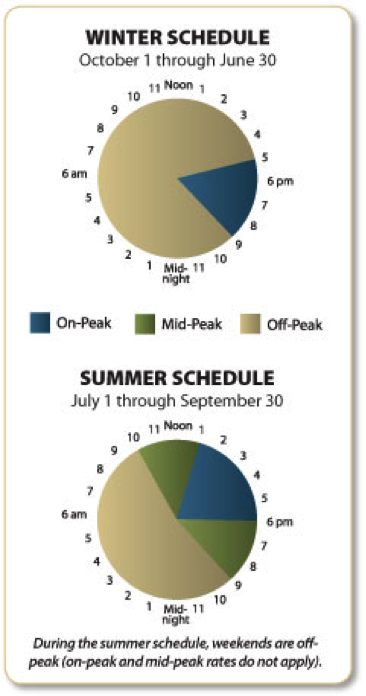 Check out your utility provider’s website and review the peak/non-peak hours and plan accordingly. See if they offer a “peak time savings hours” program and get credit on your electric bill. Watching your energy use during non-peak hours WILL lower your utility bill! My parents starting watching peak hours and their electric bill went from $110.32 to $98.33 per month (on the equal pay plan). They live in the Southwestern United States where the summer temperatures reach upwards of 110 degrees. That is a savings of $143.88 per year! Thanks, glad you are enjoying the tips!